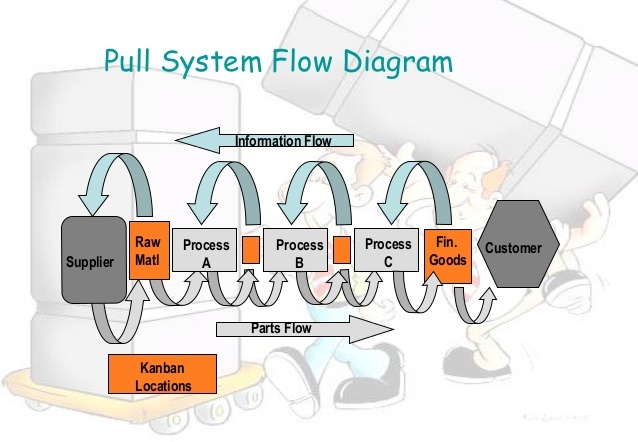 ​When you talk about Lean Production, you can have two different types of production system: the pull production system and the push production system. The pull production system is when the production is completely influenced by demand. When a certain product has demand, it continues to be produced; when the demand starts to decrease, the production also decreases; when the demand starts to increase, the production also increases; and when there's no demand at all for that specific product, the product isn't produced anymore. On the contrary, a push production system is also seen as the traditional production system. In this case, the production is scheduled based on the anticipation of the demand. These systems usually carry a lot more weight on the organization because the organization will have a much larger inventory and items.